It’s a Saturday. Such an excellent day for documentary films. Of course, if I ever catch myself watching documentary films on Friday, Ganesh forbid, I will have to admit that my soul forever rests in the land of nerdom. But it’s a Saturday. And a Saturday is a perfectly acceptable day for an edifying documentary film without losing any sense of hipness at all. And if there is any documentary film that is perfect for a Saturday, let me just say, that Ken Burns’ eponomously titled documentary DVD, Frank Lloyd Wright, is a masterpiece edifice of its own. The film follows the path of the iconic architect, even his less-than-glamorous history of philandering and his penchant for self-promotion. But, through it all, emerges a portrait of a man who did it to create beauty. And it is a uniquely American and transcendentalist notion of beauty — a perception of beauty that bequeaths “nature with a capital ‘N’,” in Wright’s own words. The beauty of this building really rests in its careful consideration of the worker. Its interior closely resembles the cathedral-like structure of a church — workers bustling away to complete orders, while the sun spills in from the six-story ceiling. But the story of Wright’s first big commission, at age 35, really rests in its demise. It is heralded as one of the biggest losses in American architectural history. The building was demolished in 1950 to make way for — what else — a parking area. All that remains of Wright’s Larkin Building is a 20-foot-hight pillar that once anchored one of the building’s corners. At one time that corner was one part of a 76-foot-high interior that rose to the sky and imbued workers with an ethereal experience via its double-glazed skylights. 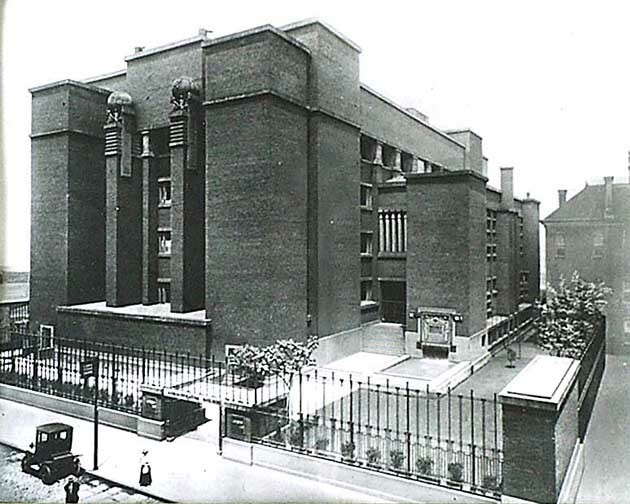 Even Wright himself, by then 82 years old, felt indifferent about the building that he spent energy designing as a young, 35-year-old independent architect, “To them, it was just one of their factory buildings, to be treated like any other,” he said. So, in 1949, for the sum of a mere 5,000 dollars, one of America’s greatest architectural designs collapsed and was replaced with a parking lot. It was once the first air-conditioned building in the U.S., but by 1949 it had become a nuisance. This entry was posted on Saturday, June 7th, 2008 at 2:10 pm	and is filed under Built Environment, Demolished, Geotagged, History, Industrial, Residential. You can follow any responses to this entry through the RSS 2.0 feed. You can skip to the end and leave a response. Pinging is currently not allowed. Thanks for the recommendation of the documentary. Thanks so much for that photo, Blaize! That seriously made my day. You’ll love the documentary. It’s available on Netflix watch now if you have that. I’m glad you liked it! I’ve been to the National Building Museum, and found it very interesting. And I do have Netflix, so I’ll check that documentary out soon. P.S. I really enjoy your web log and your flickr photostream. Great pictures on your site. I live in Rochester, NY. 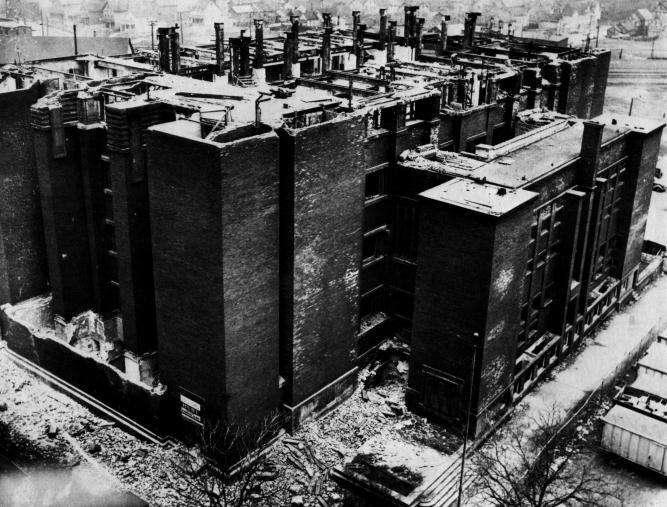 The Larkin building was destroyed the year I was born. As I write, the last tenants are moving out of Midtown Plaza, the masterfull 1960 creation of Victor Gruen, so that it can be destroyed to make way for a corporate headquarters. It was the second enclosed mall in the country. Stupidity never ends. Thanks Dave. I didn’t know about Midtown Plaza. Such a shame… Things like that seem to be happening more and more these days. I think we’ve also lost more than one Kirkbride in the past few years. So sad that this building was lost but Buffalo remains a great place to visit for FLW and other architecture. I stumbled on this site, while trying to research the Larkin Building fire in 1949- 1950. My father was a Fire Fighter, and was injured during the blaze. His name was Glenn Russel Ralph. I had a photo my mother gave me as a child, of my Dad being assisted from the area. It was front page news in either the Courier Express, or the Buffalo Evening News. I have since lost the photo, and wanted to pass it on to my son. 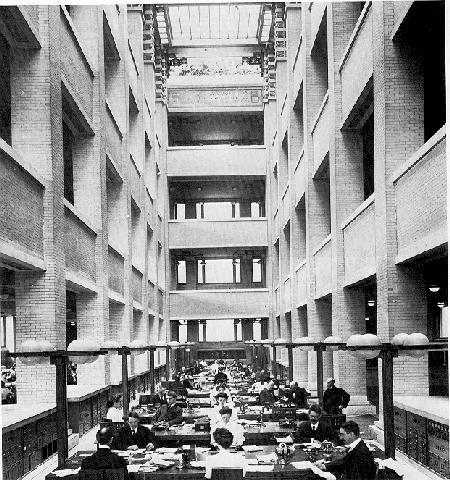 I had no idea of the relationship of Frank Lloyd Wright, and the Larkin Building until this day. It’s a wonderful web-site! Thanks Micheal. I appreciate the added history. I’m always elated to hear about the personal stories of places. Thank you. Interesting photos. I love Wright, but the exterior has a very oppressive look, possessing equal parts mausoleum and Reichstag. Nice interior flourishes on the columns and skylights though. I have a desk that was once belonging to my father. Upon brining it home I discovered a label on the back bearing the name Larkin Soap Co. and another label stating it was manufactured at Larkin Soap Co. 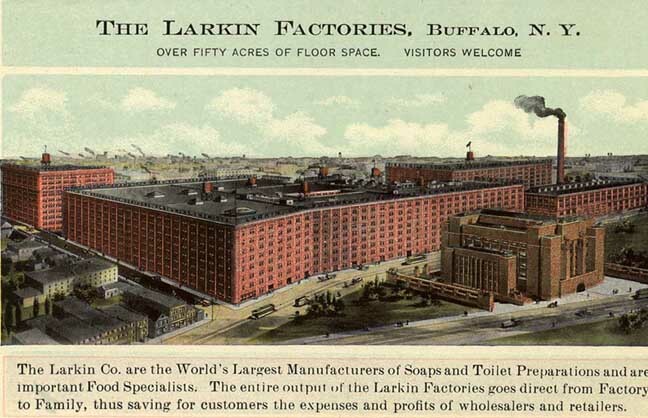 I was trying to research it a little and I seems to find more information about the Larkin Administrative building then the products it once made. If anyone should have a source of information that might be helpful feel free to contact me. I think I have almost saved enough money to make an offer. Not. My father-in-law’s offices were accross the street on Seneca St Buffalo. One day I walked around the area and found some of the foundations of the buildings still in tact. This is an example of why it is sooo important to support restoration and preservation efforts in your town, you never know what you are saving.. If I may offer a counter opinion, I would term this building style “American Brutalist,” after the Fascist penchant for building edifices which are meant to oppress the viewer and worker within. And as for Wright’s famed embrace of nature in his designs, I honestly see absolutely nothing at all natural about the spaces depicted. Nature does not have straight lines to it; the human form factor does not conform to hard corners and edges as this building is architected. It is, frankly, a very ugly design. Dennis: I definitely appreciate your interpretation. In some ways, I do agree. However, I think one has to look at the Larkin Building as if it existed today. Would you rather work in a tall cathedral of natural light (and the first air-conditioned commercial building in the U.S.), or would you choose the office of today – a farm of cubicles and fluorescent light? Perhaps the Larkin Building was the egg and the controlled environment of the office space today is the chicken, but I’d much rather spend my days toiling in the egg than the chicken, so to speak. I have a question for anyone who can help. I want to do a dissertation on F.L.Wright’s furniture for my MA in Fine and Decorative Arts. The Larkin Building would have been perfect if some idiots didn’t destroy it. Does anyone know where I could get direct information such as archives, and personal papers Wright may have written about the builing from? The internet is good and so are books but I need primary sources to make my dissertaion work. Thank you tons to anyone who can help. I am very trustworthy if that is an issue and actualy go to school with Sotheby’s. I too would like more info. on the products made/sold out of the Larkin Bldg. My grandmother of 93 yrs. old said she and her father made pasta in the Larkin Bldg. My father who passed in 1986 told me his first job was delivering the mail in the Larkin Building. He said they would give him a mail bag and a pair of roller skates and he would skate through the whole building delivering. I would love to find a picture of the workers at that time, probably 1034-36, he was only 13. Incredible stories, Carole and Joany. Please feel free to continue with the memories. 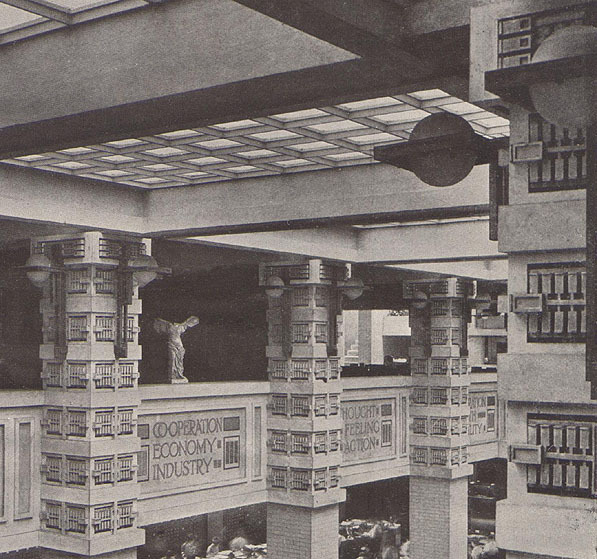 Now that Buffalo has been a destination for followers of Frank Lloyd Wright architecture and the beauty of the Roycroft, are there plans to rebuild the Larkin Building? Throughout this grand design of things you secure a B- with regard to effort. Exactly where you confused us was in all the specifics. As it is said, details make or break the argument.. And it could not be much more accurate at this point. Having said that, allow me say to you exactly what did do the job. The article (parts of it) can be really engaging and that is possibly the reason why I am making an effort to comment. I do not really make it a regular habit of doing that. Second, despite the fact that I can notice the jumps in reasoning you come up with, I am not certain of how you seem to unite the points which in turn produce your conclusion. For the moment I will subscribe to your issue however wish in the foreseeable future you link your facts better. My grandmother lived by The Larkin Building on Seneca Street, where the 7 firefighters perished. I knew of this building but not of The Larkin Administrative Building just a few blocks away. I wish I could have taken a tour of it, like I do with all the beautiful and preserved buildings downtown and on Elmwood. I’m glad I have the opportunity to at least see the remaining historic buildings here in Buffalo. My Professor at Canisius College (back in 1981) got me into Buffalo’s architecture. If you want to see magnificent architecture you have to come to Buffalo. To all those who offered the opinion that this building was “ugly” and “oppressive” I will only counter with the fact that beauty…much as everything else in this world…is completely subjective and always open to personal interpretation. To me this building eschews everything that was the grandeur, the splendor and the spirit early 20th century America. It was indeed a work of art… and its a travesty that it was destroyed to create space for a parking lot. Correct me if I’m wrong, but I go running by the site whenever I’m in Buffalo, and it looks to me like the pillar still there was not part of the building, but part of the fence surrounding the building. The Larkin Administration building designed by Frank Lloyd Wright is a beautiful piece of industry and art combined. I love the look of this buiding and all that it stood for, it is a shame that we did not keep up with such beauty. Thanks for sharing this information to me. Michael Ralph wrote in 2008 about his father and the missing photograph. I believe I have that photo from my cousin whose father also fought at that fire. I would like to send it to you for him if possible. I tried to find a facebook page for Michael but unsure if it is correct. Thank you.